InfoGro - Contact Info, Locations and Terms and Conditions. Since Infogro's establishment in 2000, we have come to dominate the ICT services sector in Brits, North West. With our outstanding services and state of the art technology, we offer both our private and business clients everything they need for a streamlined information system. 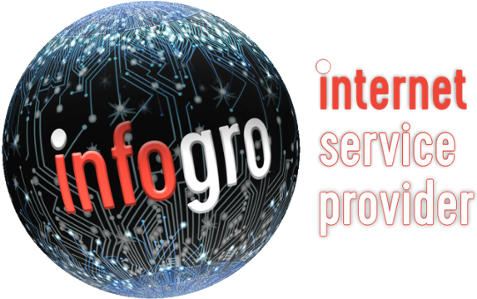 Infogro is anyone’s one stop shop for the latest ICT services and products, of which include: VoIP, internet, sms, access control, software development, turnkey solutions, routing, switching, firewalling, procurement and on-site support. Infogro also offers fast and reliable ADSL broadband internet on a national scale. In 2017 Infogro’s broadband internet speed was placed in the top 50 fastest within South Africa. This award is a good depiction of the quality and ground-breaking service and technology we have to offer. Our “Home” packages will not subject a monthly usage threshold but usage may be subject to throttling, based on the at that time network demands. Premium services may be shaped to reduce network load. Infogro will, as far as possible, operate the network in such a manner that there is very little or no throttling on our Uncapped accounts. Under high network load, shaping or throttling will take place on Home packages, if the strain persists only then will Premium packages be throttled. Business packages will not be shaped or throttled. No shaping or throttling will take place unless needed, which means that you will only be shaped or throttled during peak periods. This also means that you will enjoy full speed internet most of the time, even after reaching your threshold. Shaping or throttling will only impact non-interactive services. This means that email, browsing, gaming and media streaming should not be affected. Please take note that some non-official streaming services provide access to media via torrent mediums, and that these services will be affected by shaping or throttling. InfoGro is a member of the Internet Service Provider’s Association (ISPA) and as a result has adopted and is bound by ISPA’s Code of Conduct. Furthermore, in terms of section 75 of the Electronic Communications and Transactions Act InfoGro has designated ISPA as an agent to receive notifications of infringements as defined in Section 77 of the Act.